I can still see my grandmother crocheting blankets in zigzag rows. She made one for each of her seven children, many of her twenty-three grandchildren (I am the eldest of the grandchildren), and for the great–grandchildren she lived to see. My grandmother, Esperanza Ortega, was the inspiration for my book Esperanza Rising. Esperanza Ortega Muñoz, approximately 19 years old. When I was a young girl, Grandma used to tell me what her life was like when she first came to the United States from Mexico. I had heard stories about the company farm camp where she lived and worked, and the lifelong friends she made there. When she talked about those people and how they had helped her through desperate, trying times, she sometimes cried at the memories. It wasn't until I had children of my own that my grandmother told me about her life in Mexico, about a fairy-tale existence with servants, wealth, and grandeur, which had preceded her life in the company farm camp. I wrote down some of her recollections from her childhood. How I wish I had written down more before she died because I could never stop wondering about her transition from Mexico to California and what it must have been like. Eventually, I started to imagine a story based on the girl who might have been her. 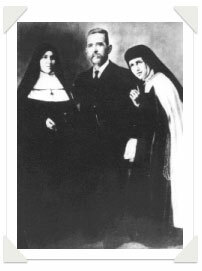 Sixto Ortega with his two sisters, nuns from a convent near Aguascalientes, Mexico. This fictional story parallels her life in some ways. She was born and raised in Aguascalientes, Mexico. Her father was Sixto Ortega and her mother, Ramona. They lived on El Rancho de la Trinidad (which I changed to El Rancho de las Rosas) and her uncles did hold prominent positions in the community. A series of circumstances, including her father's death, eventually forced my grandmother to immigrate to the United States to a company-owned farm labor camp in Arvin, California. 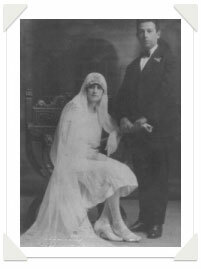 Unlike Esperanza in the story, my grandmother had already married my grandfather, Jesus Muñoz, when she immigrated to California. Like Miguel, he had been her father's mechanic. In the segregated Mexican camp, with my grandfather, she lived much like the characters in the story. She washed her clothes in communal tubs, went to jamaicas on Saturday nights, and cared for her first three daughters. That's where my mother, Esperanza Muñoz, was born. During the early 1930's there were many strikes in the California agricultural fields. Often, growers evicted the strikers from their labor camps, forcing many to live together in makeshift refugee camps, sometimes on farms on the outskirts of towns. The growers were powerful and could sometimes influence local governments. In Kern County, sheriffs arrested picketers for obstructing traffic, even though the roads were deserted. In Kings County, one Mexican man was arrested for speaking to a crowd in Spanish. Sometimes the strikes failed, especially in areas that were flooded with people from states like Oklahoma who were desperate for work at any wage. In other instances, the strong voices of many people changed some of the pitiful conditions. Esperanza Ortega Muñoz (age 16) and Jesus Muñoz on their wedding day. The Mexican Repatriation was very real and an often overlooked part of our history. In March of 1929, the federal government passed the Deportation Act that gave counties the power to send great numbers of Mexicans back to Mexico. Government officials thought this would solve the unemployment associated with the Great Depression (it didn't). County officials in Los Angeles, California, organized "deportation trains" and the Immigration Bureau made "sweeps" in the San Fernando Valley and Los Angeles, arresting anyone who looked Mexican, regardless of whether or not they were citizens or in the United States legally. Many of those sent to Mexico were native-born United States citizens and had never been to Mexico. The numbers of Mexicans deported during this so-called "voluntary repatriation" was greater than the Native American removals of the nineteenth century and greater than the Japanese-American relocations during World War II. It was the largest involuntary migration in the United States up to that time. Between 1929 and 1935 at least 450,000 Mexicans and Mexican Americans were sent back to Mexico. Some historians think the numbers were closer to a million. Even though my grandmother lived in this country for over fifty years, I can still remember her breaking out in nervous perspiration and trembling as her passport was checked at the border when we returned to the United States from a shopping trip in Tijuana. She always carried the fear that she could be sent back on a whim, even though repatriation had long been over. My father, Don Bell, came to California during the Dust Bowl from the Midwest and, ironically, worked for the same company farm where my mother was born. By that time, my grandmother had moved her family to a small house in Bakersfield at 1030 P Street. Mom and Dad weren't destined to meet quite yet. Dad was 12 years old when he picked potatoes during World War II with the "Diaper Crew," children paid to pick the fields because of the great shortage of workers due to the war. He says the children weren't always the most diligent employees and admits he more often threw dirt clods at his friends than he picked potatoes. Later, when he was 16, he spent a summer working for the same farm, driving trucks back and forth from the fields and delivering workers. Much of our nation's produce comes from this one area in California. It is hot in the summer and cold in the winter. There are dust storms and "tule fog" and some people do contract Valley Fever. Before I got married, I took the required blood test in San Diego, where I had lived during my college years. The doctor called because of an "urgent finding" on my lab results. I worried that something dramatic had been found, until the doctor said, "You tested positive for Valley Fever." I let out a sigh of relief. I grew up seeing lugs of grapes on kitchen tables. I picked plums, peaches, apricots, nectarines, persimmons, almonds, walnuts, and pecans from backyard trees. Every year in August, I saw the grapes laid down on the ground to make raisins the same way they've been made for generations. Lemons, tomatoes, or squash appeared on our doorstep from neighbors' or my grandmothers' gardens. I'd never been conscious of having any symptoms of Valley Fever. The only fever I recollected was my burning affection for my beginnings and belongings. "Of course I tested positive," I said to the doctor. "I grew up in the San Joaquin Valley." I knew that I had been naturally immunized to the actual disease by merely living there, from the air I had breathed growing up. My family's feelings for the company camp are deep-rooted and still filled with loyalty for their start in this country and for the jobs they had at a time when so many had none. Most of the people I interviewed who lived in the same camp with my grandmother held no grudges against the Oklahomans or others who competed for their jobs at that time. One man I interviewed said, "We were all so poor. The Okies, the Filipinos, they were poor, too. We all knew the feeling of wanting to work and feed our families. That was why it was so hard for so many of us to strike." When I asked about prejudice I was told, "Sure there was prejudice, horrible prejudice, but that's how things were then." Many struggled just to put food on the table and sometimes seemed to be resigned to the social issues of the time. They focused only on survival and put their hopes and dreams into their children's and grandchildren's futures. That's what my grandma did. She survived. All of her children learned English and so did she. Some of her children went to college. One became a professional athlete, another a member of the United States Foreign Services others became secretaries, a writer, an accountant. And her grandchildren: newscasters, social workers, florists, teachers, film editors, lawyers, small business owners, and another writer: me. Our accomplishments were her accomplishments. She wished the best for all of us and rarely looked back on the difficulties of her own life. It is no wonder that in Spanish, esperanza means "hope."